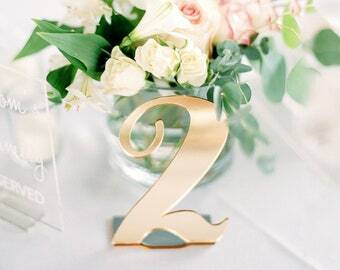 Our acrylic wedding table numbers are precision cut to order for a unique addition to your wedding decorations. 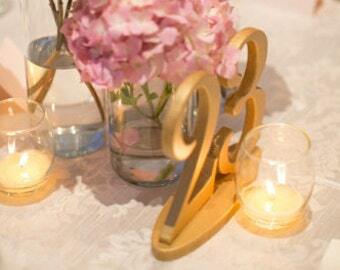 These table numbers will add a touch of class and style to your wedding or event centerpieces. Customize your order by choosing your font and your choice color. 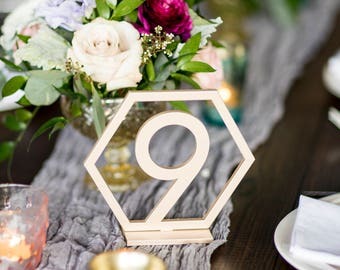 These versatile table numbers offer a different and beautiful look that is guaranteed to impress and to fit your desired style. 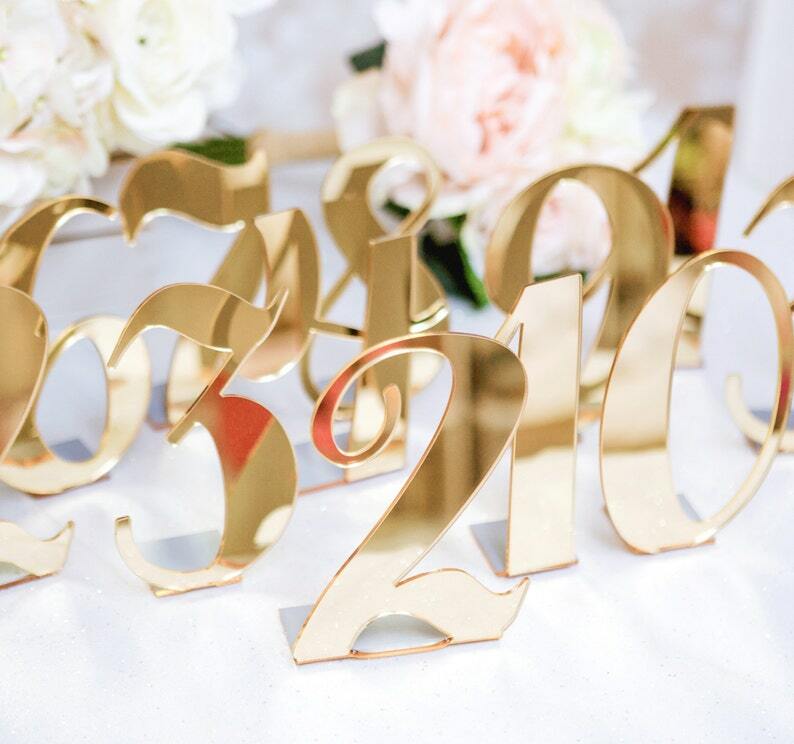 Available in gold mirror, silver mirror or a modern clear acrylic, these numbers pick up the surrounding colors and detailing making them a perfect fit for almost any setting while still being visible to your guests. Choose quantity when adding to your cart. i.e. 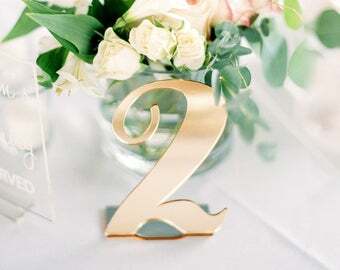 quantity of 5 = table numbers 1-5. quantity of 20 = table numbers 1-20. For specific numbers or any special requests, please send us a message for a custom listing. Please include your wedding date in the "note to seller" at checkout to ensure a timely delivery. ***Be sure to FAVORITE this item by clicking the heart ---> on the right ---> to mark it for later! Initial Sets: www.etsy.com/listing/193048158 <--combined shipping! Mr & Mrs Signs: www.etsy.com/listing/240868483 <--combined shipping! Add-on one or all of these items and they ship FREE with your order! BUY WITH CONFIDENCE! OUR FEEDBACK STANDS FOR ITSELF. 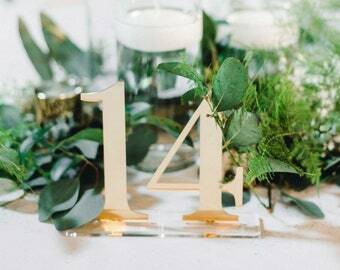 We are proudly part of the MAKERS REVOLUTION and manufacture our table numbers in house from raw materials. Nothing is imported - nothing is made in a factory. 100% made in the USA. All of our wood is formaldehyde-free! © All intellectual property owned by Z Create Design Copyright 2012 Z Create Design. All rights reserved. DO NOT COPY OUR ORIGINAL WORKS OR OUR ITEM DESCRIPTIONS OR WE WILL TAKE LEGAL ACTION. How do I request a change to my order that has already been placed? If you have ALREADY placed an order and need to make a change, request a rush, or add information to the order, please send us an email at zcdcustomer@gmail.com for assistance on orders already placed. Customer service inquiries are answered in the order that they are received M-F 9am-3pm. My Item arrived broken! What do I do? Contact us at zcdcustomer@gmail.com. We happily replace items if they are defective or damaged. No additional shipping will be charged in cases of damaged or defective products when sending a replacement. Please retain the product in the original packaging unless otherwise instructed. What qualifies a purchase as a custom item? A custom item includes any of our personalized products (names or dates, monogram items, etc. ), special requests and painted products. We do not keep stock of our items as everything is made to order. We offer a large variety of colors and style options and therefore cannot accept returns or exchanges on painted items. Because all computer monitors are calibrated differently, returns based on color are not accepted. Where else can I find 1" thick freestanding signs? Nowhere! We offer the thickest signs around and if we say it free stands, we guarantee that it will not fall over. Our 3/4" thick and 1" thick signs are tested and proven to stand on their own sturdily. Yes! 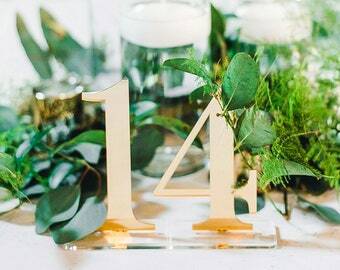 Our 'Early Bride Discount' for 10% off wedding table number orders when placed 6+ weeks prior to the wedding or event date is available. Ask for details! Check our store announcement for seasonal sales and coupon codes! Discounts cannot be applied after purchase or once a sale has ended, so take advantage of sales when they occur! We are based in Florida in the US. Why haven't I received a response to my inquiry yet? We answer inquiries M-F 9am-4pm and limited hours on the nights and weekends. We answer questions as quickly as we can and appreciate patience during our busiest time of year August and September. We may not be available on holidays for customer service, but will resume on the following business day. Thank you! Have a problem with your order? BEFORE opening a case, please send us a message via Etsy or to zcdcustomer@gmail.com. We will help in any way we can! Please allow 24-48 hours for a response M-F. Thank you! Can we call customer service? Do you have rose gold mirror? 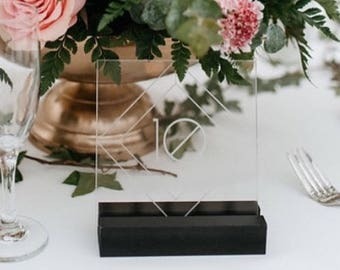 We have rose gold mirror! We will add to our listings ASAP - if you would like to order, please send us a message!